Hinchcliffe & Company, Asuret, and Socialtext jointly announced today a major new strategy and implementation service to help organizations with their social computing initiatives. The new service, known as Pragmatic Enterprise 2.0, is intended to achieve a new level of maturity in the industry and is designed to provide businesses with the easiest, lowest-risk "on ramp" to the benefits of social computing. Available in November, this service is intended to set a new high-water mark in enterprise social media strategy and implementation. most organizations have a limited understanding of the real state of their IT projects and how well they are meeting expectations. Our strategic project intelligence capability ensures that Pragmatic Enterprise 2.0 customers have a clear and ongoing sense of whether their needs are being met in social business scenarios and if their concerns are being addressed. Hinchcliffe & Company, Asuret, and Socialtext jointly announced today a major new strategy and implementation service to help organizations with their social computing initiatives. The new service, known as Pragmatic Enterprise 2.0, is intended to achieve a new level of maturity in the industry and is designed to provide businesses with the easiest, lowest-risk "on ramp" to the benefits of social computing. Aimed at enterprises large and small -- see below for list of industries -- Pragmatic Enterprise 2.0 combines the strengths of three leading players in enterprise IT with Hinchcliffe & Company's delivery and methods, Asuret's strategic project intelligence and risk navigation, and Socialtext's industry leading social tools. Usable at various stages in a social computing effort, Pragmatic Enterprise 2.0 offers companies an effective way of adopting social tools that can save years of experimentation and retry. "Most organizations are still in the early stages of understanding how to leverage social computing in their businesses to get useful results. Pragmatic Enterprise 2.0 brings together years of lessons learned and industry experience into a mature, holistic, yet lightweight approach. This service will rapidly help businesses access the full benefits of social media in the enterprise while actively managing potential downsides", said president of Hinchcliffe & Company and widely recognized Enterprise 2.0 thought leader, Dion Hinchcliffe. Ideal for social collaboration, intranet redesigns, online customer communities, social CRM, and other social business scenarios, Pragmatic Enterprise 2.0 is an integrated combination of strategy, implementation, and full-lifecycle rollout that reflects the practical realities of the enterprise world including concerns around ROI, value generation, risk, control, and trust. Far from being a rigid template, however, the service is based on adaptive, lean methods that identify and meet the unique requirements of each organization. Asuret CEO and IT project risk thought leader Michael Krigsman said that "most organizations have a limited understanding of the real state of their IT projects and how well they are meeting expectations. Our strategic project intelligence capability ensures that Pragmatic Enterprise 2.0 customers have a clear and ongoing sense of whether their needs are being met in social business scenarios and if their concerns are being addressed." Pragmatic Enterprise 2.0 contains the most complete big picture of social computing currently available. This includes the various factors required for successful outcomes, including how to drive adoption, manage social communities, improve productivity, drive innovation, and situate social tools in the context of effective policy, governance, security, and change management. The service is aimed at industries that are increasingly impacted by but usually less-than-familiar with social computing including financial services, healthcare, insurance, transportation, scientific/technical, and federal, state, and local governments. "We're excited to be the default toolset for Pragmatic Enterprise 2.0 customers. Socialtext is one of the most complete, mature, and widely recognized set of social tools currently available and we believe that our extensive experience in many industries and verticals can help ensure that a wide range of Pragmatic Enterprise 2.0 customers can safely and effectively adopt social computing as a better way to solve many business problems", said founder of Socialtext and well-known social software thinker Ross Mayfield. 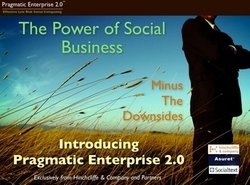 A limited number of engagements of Pragmatic Enterprise 2.0 will be available beginning in November, 2009. Get a private briefing today on the details of Pragmatic Enterprise 2.0 by contacting us at info@hinchcliffeandcompany.com or 877-HIN-CHCL (877-446-2425). View the latest information about the service at http://hinchcliffeandcompany.com/pragmaticenterprise2/. About Hinchcliffe & Company, Inc.
Hinchcliffe & Company is a leading premier consulting firm in the areas of Web 2.0, Enterprise 2.0, social computing, cloud computing, and next-generation SOA. Based in Alexandria, Virginia, Hinchcliffe & Company delivers strategy and implementation services across North America, Europe, and Asia. Specializing in large enterprises, Hinchcliffe & Company's clients includes some of the largest companies in the world on three continents. Combining thought leading approaches with agile methods, cutting-edge research and innovative techniques matched with extensive field experience, Hinchcliffe & Company offers one of the most effective and up-to-date approaches for helping businesses transform to newer and more effective models for computing, IT, and business. Hinchcliffe & Company also founded and operates the popular Web 2.0 University, which it uses to drive strategic change in organizations around the world. Learn more about Hinchcliffe & Company at http://www.hinchcliffeandcompany.com. Asuret develops specialized software that enables IT projects to achieve planned results efficiently and fast while navigating risk and managing stakeholder expectations. Learn more about Asuret at http://www.asuret.com. As the Enterprise 2.0 leader, Socialtext applies Web 2.0 technologies to the critical challenges facing businesses. Enterprise 2.0 enables the collective intelligence of many, which provides a competitive advantage by increasing innovation, corporate agility, strengthening customer relationships and growing revenue. Socialtext provides hosted and appliance-based solutions to more than 5,000 customers world-wide, including Acumen Fund, BASF, Boston College, Davies Public Affairs, EgonZehnder, Emergent Solutions, Epitaph Records, The Hospital for Sick Children, IKEA, Intel, MicroStrategy, 'mktg', OSIsoft, SAP, Sungard and Symantec. People are the Platform. Socialtext Workspace, is the first enterprise wiki and includes robust capabilities such as collaborative blogs. Socialtext Signals provides private Twitter-style microblogging. Socialtext People enables enterprise social networking. Socialtext Dashboard provides personalized and customizable widget-based interface for people and teams to manage attention. SocialCalc is the social spreadsheet for distributed teams. Socialtext Desktop brings it all together in a dynamic desktop application. Learn more about Socialtext at http://www.socialtext.com.